Frequently asked questions about CampusOne. What is CampusOne Student Residence? CampusOne is a newly built student residence affiliated with the University of Toronto. 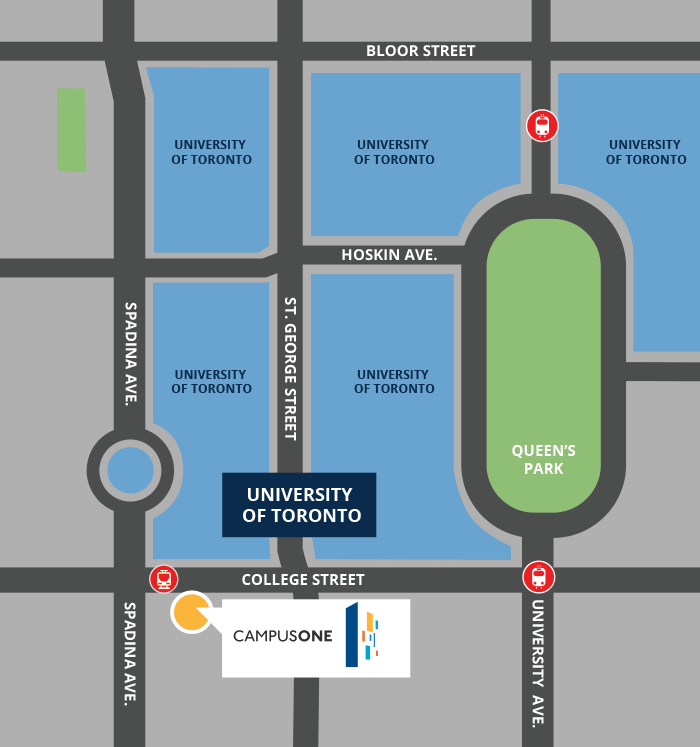 Directly across the street from UofTs main campus, CampusOne is the ultimate student residence experience. Enjoy spacious urban living and state-of-the-art amenities in a safe and secure environment. A diverse mix of Canadian and international students will enjoy this all-new community. Like Toronto itself, CampusOne is a vibrant and welcoming community. What type of accommodations are offered? Click here to view our rates and floor plans. All residents at CampusOne participate in the community’s dining program in the 9,000 sq. ft. dining hall. This dining program operates on a declining balance system. Lite – This is a great plan for students who visit family on weekends, spend lots of time away from the residence, or are light eaters. Average – This is a great plan for students who are average eaters, who tend to stay on campus most weekends, and whose schedules allow them to make it back to the residence for meals on a regular basis. Varsity – This is a great plan for students who expect to be consistently on campus, and in or near the residence, seven days a week (or just can’t get enough of our amazing food). At Campus One, all food items are individually priced – just like a restaurant! You only pay for what you select. Campus One Meal Plans also allows you to utilize our Grab and Go Program - may it be a Sandwich for lunch or one of our home-made soups or stews you want to heat up later while studying into the late night. Your meal plan selection is required to cover BOTH Fall and Winter semester. You receive ALL your meal plan dollars for both semesters at the beginning of the fall semester. Once you select your Campus One Meal Plans, you enter into a contract with the CCC. Please review all the Meal Plan information, terms and conditions carefully in our dining book to ensure you have chosen the right meal plan to fit your needs. View the CampusOne 2018-2019 Dining Book for more information. Can I live with friends, or can you match me with a roommate? You can select your roommate(s), or you can apply on your own and we can match you with other students. While a perfect match is never guaranteed, applicants answer a short list of lifestyle questions to aid in the matching process. What is individual leasing liability? Instead of requiring all roommates to sign a joint lease, each person at CampusOne has their own individual contract, with one person per bed space. This means you are only responsible for paying for yourself — not your roommates. Even if a roommate moves out or other bed space in your unit is empty, you only pay the rate for your bedroom. Water, internet and hydro are included in our utilities package. The standard term runs from the start of August to the August of the following year with payments made in 12 equal installments. Please inquire with our leasing centre for specific start and end dates or alternate terms. Yes. Residents can pay online 24 hours per day, by Visa, MasterCard, American Express, electronic bank transfer or PAP. CampusOne also offers automatic payment by credit card. And of course cheques are always welcome! Should you choose to opt for the online option, please click here to make a one-time or monthly payment. Will my financial aid cover charges at CampusOne? Your living costs at CampusOne can be covered by financial aid, just like on-campus housing. Any available financial aid funds, after university charges are satisfied, are released to the student for non-institutional expenses, such as off-campus housing. These funds can be used to pay charges at CampusOne. Normal payment deadlines will continue to apply. CampusOne has a secure entry system, along with a professionally-staffed front desk 24x7 and security cameras in all common areas. Management staff and our dedicated Community Assistants are on-site 24×7 and can be reached by a 24-hour phone number. CampusOne has monitored fire sprinklers, electronic locks on each front door, plus individually locking bedroom doors. CampusOne is a smoke-free community in all indoor areas. Invited guests are welcome at all times, subject to the consent of roommates and security considerations. Overnight guests are welcome, with limits on the number of days and guests. Please contact a member of our leasing team to set up an appointment. With model furniture and amenity renderings for show, we will be able to provide you all the necessary and detailed information you need to make CampusOne your next home! Who is the day-to-day Manager of CampusOne? Canadian Campus Communities (CCC). CCC has established itself as Canada's premier provider of student housing services to colleges and universities, offering private sector assistance in managing on and off-campus student housing. CCC's extensive student housing experience enables them to develop innovative student communities that meet the needs of university partners and clients, while providing the most cost-effective, luxurious student living and learning communities for student residents. CCC’s corporate office is located in Austin, Texas with its parent company, American Campus Communities. Are in-suite cooking facilities available? Yes, select in-suite kitchens are available and include all your major necessities: full-sized refrigerator, oven/range, dishwasher and microwave/hood combo. Limited quantity available. Conveniently located across the street from UofTs main campus, residents can easily walk or bike to campus in minutes. CampusOne offers in-building bicycle storage. Many of Toronto’s endless attractions are just moments away, and with CampusOne located at the corner of College and Spadina, access to Toronto’s transit system has never been easier. The TTC streetcar stops right outside of CampusOne and the TTC underground subway station is within a close walking distance. Monday to Sunday 9 a.m. - 9 p.m.